In the months to come, I can imagine history falling prey to people who want to claim that our democracy, justice and liberties owe everything to the “Men of 1916.” But next month marks a far more significant anniversary when it comes to understanding the political freedoms and the system of justice we enjoy today. Magna Carta was sealed by King John at Runnymede, near Windsor, 800 years ago on 15 June 1215, and has become the document that inspired the core values of our modern democratic society, including liberty, the rule of law, the separation of powers, parliamentary and constitutional government, taxation by popular consent, the rights of “all free men,” trial by jury, due process of law, an independent judiciary and an independent legal profession. Many of the provisions of Magna Carta are still enshrined in Irish law, and Irish magnates and prelates played a key role in shaping its words and ensuring it was accepted by a despotic king who had engaged in a vengeful war of oppression and attrition in Ireland a few years earlier. 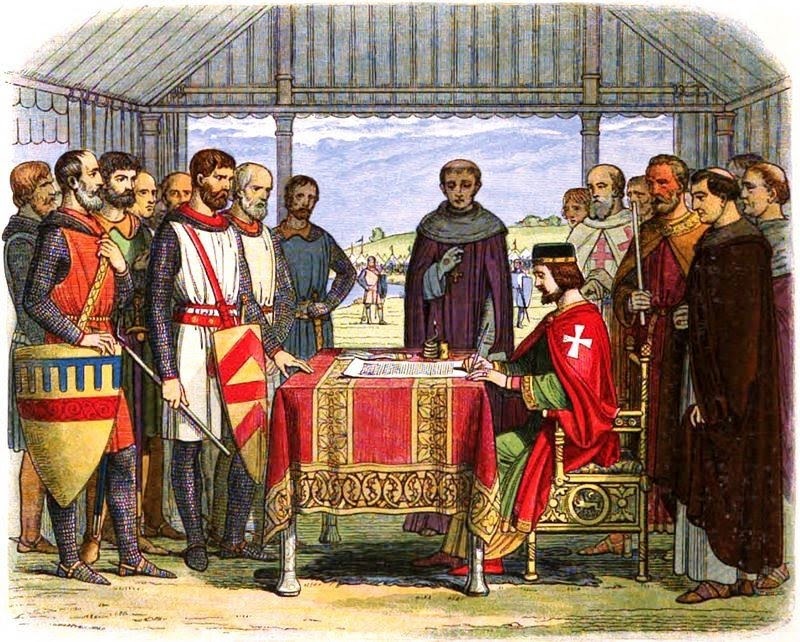 However, few people realise that the origins of Magna Carta lie in a major dispute between Church and State at the beginning of the 13th century. Stephen Langton was Archbishop of Canterbury from 1207 until his death in 1228. The dispute between King John of England and Pope Innocent III following his election was a major factor in the crisis that led to Magna Carta. Stephen Langton was lecturing in theology at the University of Paris in 1206, when Pope Innocent III called him to Rome to become a cardinal. 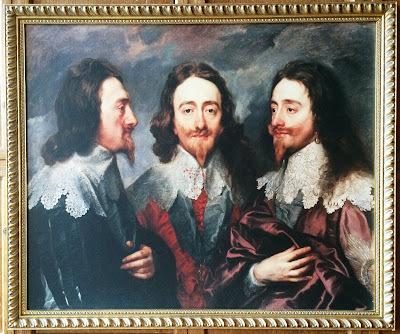 Hubert Walter, brother of Theobald Fitz Walter, ancestor of the Ormond Butlers, had been Archbishop of Canterbury. When he died in 1205, a dispute broke out between King John and the monks of Canterbury Cathedral about the choice of a new archbishop. Both parties appealed to Rome, and in the presence of the Pope, 16 monks Canterbury, elected Stephen Langton, who was consecrated by Innocent III in 1207. However, King John disputed the election and declared anyone who recognised the new archbishop was a public enemy. When he expelled the monks of Canterbury, Pope Innocent III placed England under interdict in 1208, and eventually in 1212 he ordered King John’s deposition. King John yielded to the Pope in May 1213 and in July Archbishop Stephen and his supporters returned from exile to England. His first act was to absolve the King, who promised to repeal unjust laws and respect liberties. However, the king violated his oath almost immediately, and the archbishop became a leading figure in a new struggle against King John. Archbishop Stephen’s leadership and the night of the barons who had captured London finally forced John to accede to Magna Carta on 15 June 1215. With his death, all parties rallied to his nine-year-old son, King Henry III, with William Marshall as his Protector. Archbishop Stephen returned to England and continued to work for political liberties and independence of England. In 1223 he again appeared as the leader and spokesman of the barons, who demanded that King Henry confirm Magna Carta. The 27 bishops and barons who advised him to accede to Magna Carta are named in the preamble. The first two who are named are “Stephen, Archbishop of Canterbury,” often considered the principal author, and “Henry, Archbishop of Dublin.” Henry de Loundres had been Archbishop of Dublin since 1213, but also held vast church interests in his own name in England, including the Deanery of Stafford and the Deanery of Penkridge, which remained outside the jurisdiction of the Diocese of Lichfield. He is buried in Christ Church Cathedral, Dublin. The other named prelates include the bishops of London, Winchester, Bath and Glastonbury, Lincoln, Worcester, Coventry and Lichfield, Rochester and Norwich, as well as the Master of the Knights Templar in England. The barons included William Marshall, Strongbow’s son-in-law, William Marshal, Earl of Pembroke, who built Kilkenny Castle. Under Clause 61, the enforcers of Magna Carta included his son William Marshal the younger, who founded the Dominican Priory or “Black Abbey” in Kilkenny and began building the castles at Ferns and Carlow. 38, In future no official shall place a man on trial upon his own unsupported statement, without producing credible witnesses to the truth of it. 39, No free man shall be seized or imprisoned, or stripped of his rights or possessions, or outlawed or exiled, or deprived of his standing in any other way, nor will we proceed with force against him, or send others to do so, except by the lawful judgment of his equals or by the law of the land. 40, To no one will we sell, to no one deny or delay right or justice. Although copies of the first Magna Carta were sent throughout England, only four original copies survive today: one is in Lincoln Cathedral, one in Salisbury Cathedral, and two in the British Library. When John died, Magna Carta was confirmed by his infant son, Henry III, and sealed with the seals of the Papal Legate and Strongbow’s son-in-law, William Marshall, the Regent. The Great Charter of Ireland – also known as the Magna Carta Hiberniae – was issued for Ireland in Bristol on 12 November 1216 and was brought to Ireland on 6 February 1217. In this application of Magna Carta to Ireland, people in Ireland were guaranteed the same rights as people in England. Magna Carta was issued a third time in its final form England in 1225, and it was confirmed by Edward I in 1297, when it became part of English statute law. The Great Charter of Ireland 1216 (I Henry III) is a retained statute in the Republic of Ireland under the Statute Law Revision Act 2007, s 2.2 (a) Schedule 1. The original Magna Carta had 63 clauses. But many of the original clauses were specific to the Middle Ages, dealing with property ownership, the workings of the justice system, and taxes with no modern equivalent. Other clauses included a law banning fish weirs on rivers, the dismissal of specific individual royal servants, and the standardisation of weights and measures no longer in use. Much of the text was rewritten in 1225, but the surviving original clauses include those defending the liberties and rights of the Church of England, confirming the liberties and customs of London and other towns, and giving all subjects the right to justice and a fair trial. The clause about justice and a fair trial remains an important legal principle to this day. It enshrines the principle that the law belongs to everyone, not just the powerful, and it is the bedrock of justice and administration of the law to this day. 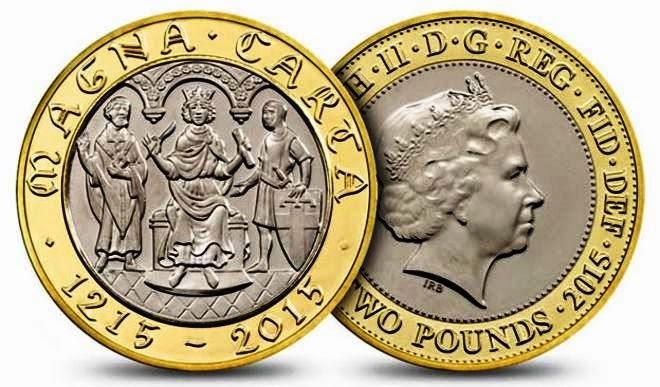 In 1265 – just 50 years after Magna Carta – the relationship between the promises made by the king and the granting of taxation paved the way for the first sitting of an English Parliament 750 years ago. In the next century, Parliament interpreted Magna Carta as a right to a fair trial for all subjects. In the Stuart period, and particularly in the English Civil War, Magna Carta was used to restrain the power of monarchs, at a time when monarchs on the continent were supremely powerful, and led indirectly to the execution of King Charles I in 1649. Magna Carta strongly influenced the American Bill of Rights in 1791, and the basic principles of Magna Carta are echoed throughout the Universal Declaration of Human Rights in 1948. Many events are marking the 800th anniversary of Magna Carta. The British Library has brought together the four existing copies of the 1215 manuscript for a special exhibition. The British artist Cornelia Parker has been commissioned to create a new artwork that will be unveiled at the British Library on 15 May 2015 and remain on display until 24 July. 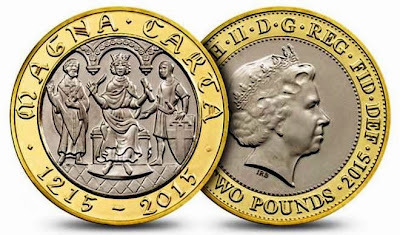 The Royal Mint has issued an 800th anniversary £2 coin that shows King John holding Magna Carta in one hand and a large quill in another. However, despite popular images and illustrations, King John never signed Magna Carta. Mediaeval kings never signed their name on legal documents, and instead John used his Great Seal to authenticate the document. But the myth continues. 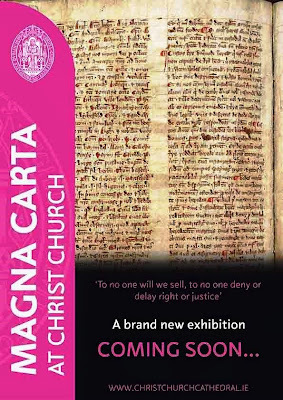 Later, Christ Church Cathedral, Dublin, is organising an exhibition to mark the 800th anniversary of Magna Carta. The cathedral possesses several early 14th century copies of Magna Carta, which were written into the Liber Niger or ‘Black Book’ created by the mediaeval canons of Christ Church. The exhibition is expected to explain the context and legacy of Magna Carta, alongside the history of the Liber Niger, and will run with a series of historical lectures, schools and community activities. Canon Patrick Comerford lectures in the Church of Ireland Theological Institute. This essay and these photographs were published in May 2015 in the Church Review (Dublin and Glendalough) and the Diocesan Magazine (Cashel, Ferns and Ossory).